Nick Costanzo needed a backpack, so he made one. The 26-year-old Milwaukee resident is the founder and owner of Vessel Workshop, a company that specializes in industrial grade backpacks and accessories, specifically designed in collaboration with bike messengers. In early 2011, Costanzo desperately wanted a job as a messenger, but couldn’t get hired in Milwaukee. He estimates that there were between 10 and 20 bike messengers working in Milwaukee during that time. So he looked elsewhere and found a gig in Denver. After six months out west, Costanzo fell on hard times when he was a victim of robbery. Going back to square one, he returned home. He didn’t let that experience stop him from pursuing his dreams of being a bike messenger, though. He finally found an opportunity to work, but he still needed a bag. A friend showed him how to make a crude backpack out of a used duffel bag and some belts. However, it wasn’t waterproof. Costanzo and his friend found an old industrial sewing factory in downtown Milwaukee. An older man who worked at the factory waterproofed the bag with vinyl fabric and inspired Costanzo to start doing this himself. The young man used his last 20 dollars to buy materials to make a bag. He hopped on his bike, rushed to his mother’s house in Bay View and promptly asked her if he could use her sewing machine. And if she would show him how it worked. After a few hours behind the needle, Costanzo had created the first Vessel bag. The timing was good. Costanzo recalls that same night there was an Underwear Bike Ride, a Milwaukee phenomenon where people gather on bikes with limited clothing to promote body positivity. Costanzo may not have been wearing pants, but he was wearing his new backpack. That bag caught people’s attention and one person offered him 150 dollars for it. He bit, and Vessel had its first customer. Pressed for cash at the time, Costanzo asked himself whether he should buy food or a sewing machine. He bought the machine. Using leftover fabric, he made a hip pouch and sold it to buy groceries and more fabric. “In the early days, this company was just a means of survival, trying to figure things out day by day,” says Costanzo. At that time he was also studying printmaking at UW-Milwaukee. Just before school let out, Costanzo was accepted into a study abroad program in Italy where he attended the oldest leather working school in the world. 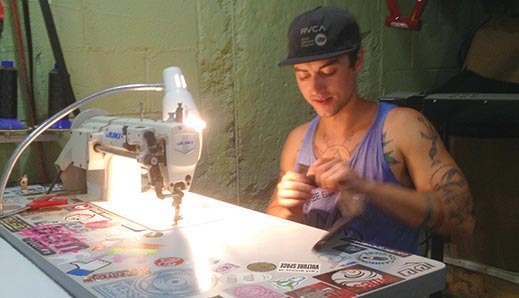 The young entrepreneur was racking up hours on both bikes and sewing machines. When he returned to Milwaukee, his work progressed, as he continued to make bags and accessories for messengers and friends around Milwaukee. Soon, Peter DiAntoni, of Flavor Cycle, who had heard about these bags, approached him and offered him a job as a messenger. The messenger and young bag designer was working an average of 16 hours a day, biking and sewing bags in his free time. Some customers had to wait up to a month or more for their bags. Costanzo moved to a three-bedroom apartment in Riverwest and set up shop. He was able to graduate from his first machine to a $1,000 industrial-grade sewing machine. He also began to use military grade materials for his heavy-duty bags. He was designing and sewing all of the products himself. It took him six months to catch up with his orders, but he did. Vessel was starting to overflow, so Costanzo decided to expand his business. He partnered with Jonco Industries, a manufacturing business in Milwaukee. Vessel Workshop now has over ten skilled workers assembling bags and accessories in a solar-powered factory. He also moved his studio out of his apartment and into the new creative workshop that just opened on Holton Street near the Beerline trail, called Wheelhouse. Wheelhouse is a space owned and operated by Curt Gest, a woodworker and cabinetmaker. The building itself was an old manufacturing warehouse that has been converted into creative studios. Costanzo was eager to move in. “Nick was actually our first tenant here. I had to get the bathrooms and his studio space built at the same time,” says Gest. Gest is collaborating with Costanzo to build his ideal workspace, as he does with his other tenants at Wheelhouse. While Wheelhouse is fully functioning as a woodshop and design studio, there is still more work going on. Costanzo is in the process of completing his design studio, but is excited for the growth of his company as well as that of the Wheelhouse. “I want people to walk into the design studio and say, ‘Woah this is incredible.’” says Costanzo. He also wants to create more versatile products that aren’t just appealing towards bike messengers. He wants to create products that a cyclist could use, but also a student, hiker or construction worker as well. He is currently designing clothing that will be made here in Milwaukee. He hopes to launch a line of pants and sweatshirts in the next year. The tenants of Wheelhouse are planning to create a retail space in the front of the shop that is welcoming to the public. Additionally, Costanzo wished to get back in touch with his roots as a designer and messenger. When he started, he was making these bags mainly for friends, all by himself. He would sell them at just above cost, proud of his work and eager to test it on riders. He plans to bring down the cost of his products that are solely meant for bike messengers. He believes that his company is for bike messengers, by bike messengers. From breaking even to breaking ground, Costanzo has pulled himself up by his backpack straps.